Teachers have been given apple- or ruler-themed gifts during Teacher Appreciation Week for years. We’re pretty sure they already have plenty of these items, so be original this year. Show your thanks with a gift from the heart. We’ve lined up three great ideas to show your child’s teacher just how grateful you are during Teacher Appreciation Week. Since this special holiday isn’t until next month (May 7 – 11, 2018), this gives you plenty of time to work on something that special teacher will always remember. 1. Thank you! Expressing the sincere gratitude from a parent or child will give teachers that extra boost they need when the going gets rough throughout the rest of the school year. Have your child make a simple card or create an original “work of art” that you frame so that teachers know how much you appreciate their efforts. Click on the image at the right for some cute ideas. 2. Gift cards! 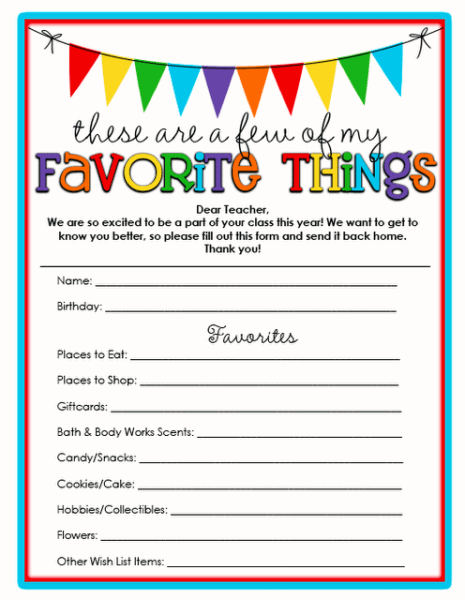 You can personalize these so that teacher receives a gift card to their favorite retail store or restaurant. Maybe their favorite deli or coffee shop. Give a gift card to a place teacher loves and they’ll think of you and your child long after it’s been redeemed. Some schools keep a list at the front office that details each teacher’s favorite items. If your school doesn’t have one, you can offer to make one using this free printable. 3. Volunteer! Teachers have so many responsibilities all day long, so take a load off your teacher. There are so many ways to help: arrange class presentations for career day, listen to a group of kids read, or help corral kids for a day or week (or all school year long!). If you’re not able to make it to the classroom, maybe your child’s grandparent or aunt or uncle would be interested in helping. Show your teacher how much you care by making things easier for them. With all the extra responsibilities teachers have nowadays, make sure you show them how much you appreciate them for all they do for your children. Take the time to give them a gift from the heart during Teacher Appreciation Week. They’ll love it!